Red Henry appears onscreen in our Learning to Hear Chord Changes DVD, but you're probably more familiar with him as the voice at the other end of the telephone if you call us to place an order. 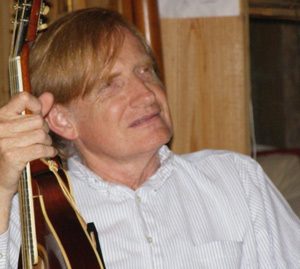 Red--Murphy's husband, chief recording engineer for the Murphy Method, and veteran bluegrass performer--felt the influence of musical giants at an early age. Playing bluegrass during his college days, he fell under the spell of such legendary Florida greats as Gamble Rogers, Will McLean, Chubby Anthony, and Dale Crider. Red never recovered! To this day he still performs on several instruments, but his primary interest is the mandolin. Bill Monroe, with his knack for getting to the point, once said to Red, “You’re a mandolin picker!” Red’s intense style is something that Monroe appreciated. A magazine review once called Red “one of the most prolific interpreters of Monroe-style mandolin picking,” but Red also writes tunes which push bluegrass boundaries while preserving the energy of Monroe’s music. In 1970 Gamble Rogers suggested to Red that he work up his first stories. Once Red made a start, he added to his repertory year by year. Those who have heard him tell stories on stage will recall his favorite protagonist, Clermont Hosford, whose misadventures and philosophical pronouncements are as legendary as his name. Much of Red’s career has been spent with the Red and Murphy bluegrass band, led by Red and his wife, the talented banjoist, singer, and songwriter Murphy Henry. From 1975 to 1986 the band performed music full time, touring extensively in Florida, Georgia, and elsewhere across the country. In 1981 Red and Murphy built a recording studio, equipped it with vintage equipment which Red restored, and began releasing Murphy's banjo lessons on cassette tape. Year by year they have added to their Murphy Method offerings, and now offer 42 music-instruction DVDs, all recorded in their own studio. In addition to the Murphy Method tapes, Red and Murphy have produced seven record albums and four CDs on their own record label, including Red’s three CDs, Bluegrass Mandolin and Other Trouble (2000), Red and Chris (2004), and Helton Creek (2007).